This division was clearly one of the most unpredictable groupings in the Tournament. Just when you thought you knew who was hot, another team would step up and surprise. Following pool play, the top 2 seeds were the favored Toronto CCYAA Seniors and the Boston Knights Seniors. Sunday’s Quarterfinals began with the winless Montreal MMAC Seniors taking an unexpected 24-23 halftime lead on the NJ Pirates. It was looking like Montreal was going to shock the world at 8:00 am. But NACBA Top 25 Selection Beaver Ho (14 points, 2 three’s, 4-4 ft’s, 3 assists) would have none of that, as he willed the Pirates to a 46-35 gutsy win. Chen Hao was the main man for Montreal with 10 pts and 4 steals, while Steve Lee chipped in 10 pts and 6 rebs for Jersey. 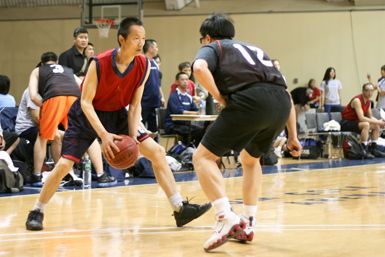 The second QF game featured the local Philadelphia Chinatown Development Corporation team and the Chicago Dragons Seniors. Chicago’s James Chow was feeling it, bombing 3 long range shots early. After taking control by double digits before halftime, Chicago cruised to a 39-10 win. The first game of the Final Four was the one that everyone thought would have been the Finals game as Toronto CCYAA and the NJ Pirates met in a rematch of the 2007 Championship. The Pirates appeared that they really wanted it this time, jetting to the advantage early on. They kept legendary Richard Zhu under wraps, limiting his touches and keeping him to only 3 points in the first half. They were faster to all the loose balls, and they were connecting from 3-point range. Center Rich Lo hit 2 big threeballs and NJ found themselves up by 5 at the break. The Pirates were poised for a return to the big stage, but Toronto was able to stay within reach. Toronto guard Stan Ong (18 pts, 4 rebs) came up huge, hitting 3 trifectas in the second half and Carlton Tenn did his Bruce Bowen defensive standout impersonation. Richard Zhu (13 pts, 7 rebs) was then able to do his thing from the charity stripe, swishing 6 of 8 freebies and getting the Pirates in foul trouble. Toronto could not be contained in the second half, as they advanced 48-38. The other Semifinal turned out to be all Chicago, with James Chow (12 pts, 3-3 freebies) continuing his torrid shooting performance. Henry Yue also came up big, scoring double digits and grabbing 8 boards. The Boston Knights were led by Harry Seeto’s 2 treys. In the end, Chicago sank 11-12 free throws to win the game. Final score was Chicago 41, Boston 27. The Finals game was a rematch of pool play, where Toronto CCYAA had defeated the Chicago Dragons. These two teams have met many times over the years, and last met on the big stage in the 2005 NACBAIT Finals. Toronto seems to be an unstoppable machine and they turned out to be all they were advertised once again. Everyone knows that Richard Zhu is the ultimate weapon, and he scored 7 points in the Finals, just to let everyone know he was still around. But in the Championship game, he let his teammates do most of the work, with Stan Ong (7 pts, 5 assists) and large Jeff Fong (9 pts, 3 rebounds) doing a good portion of the scoring. After taking a 21-14 lead at the half, Toronto stretched it out to a 39-25 Championship for the repeat. Henry Yue was the leader for the Dragons, tallying 10 pts. Congrats to the CCYAA Seniors once again. Carlton Tenn, Toronto CCYAA Sr.
Henry Yue, Chicago Dragons Sr.
Stan Yau, Chicago Dragons Sr.
Rich Wong, Boston Knights Sr.